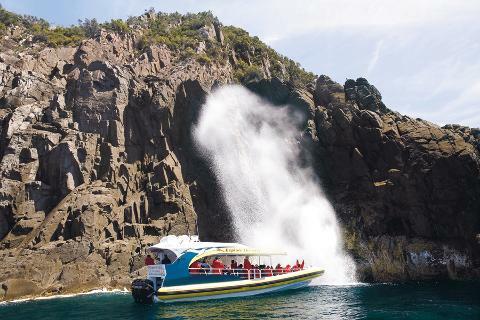 You just can't go to Tasmania without whale watching. Your trip would simply be incomplete! With whales jumping out of the water, spinning in the air, and diving back in with a huge splash, you will find yourself gasping in delight. What makes whale watching in Tassie an experience of a lifetime is that its waters are home to one of the rarest species of whales - the Southern Right Whale. 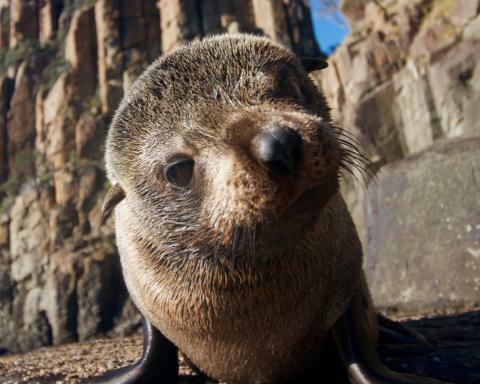 Due to its relatively calm waters and being in the whale migration path, Tasmania is one of the best places to spot these magnificent sea creatures. It is especially attractive to landlubbers. 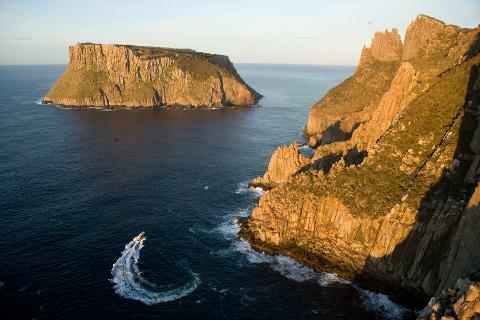 If you are not that comfortable being out in the open sea, but want to behold whales in their natural splendour, then Tassie is the perfect destination since you do not have to go too far from the coastline. It won’t be long till you find yourself saying “Thar she blows!”. Go where the whales are: on the east coast. Frederick Henry Bay and Great Oyster Bay are where the most whales are spotted. We do not know if the reason is that the whales like the calmer waters or because these areas are almost always teeming with observers, but the east coast should be on your list of stops if you want to see whales. The good news is that you have a relatively big window to see whales. Are you a fan of Humpback Whales? Visit between May and July. During these months, Humpback Whales migrate from the south towards Queensland and Western Australia. Alternatively, visit from September to November to observe them as they go back south. Do you want to see the rarer Southern Right Whale instead? 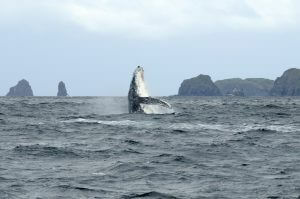 Plan a trip from June to September, which is when the whales head towards south of the mainland. From September to late October, you can still spot them as they go back in the opposite direction. Let’s put on our zoologist hat for a moment and understand whales a tad, shall we? At the very least, it’ll give you bragging rights when you come back from your trip! Whales, like dolphins and porpoises, are cetaceans. There are 2 types of cetaceans: baleen whales and toothed whales. Baleens eat krill and other tiny sea creatures. They have 2 blowholes, which they use to breathe when they surface. Toothed whales, on the other hand, use their teeth to catch fish, squid, and other larger sea creatures. They only have 1 blowhole. 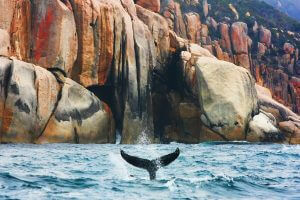 Tassie is home to 2 famous kinds of baleen whales: the Humpback Whale and the Southern Right Whale. These two are some of the largest baleens, making spottings spectacular events. Animals migrate for two reasons: to find better food sources or to breed. The Humpbacks and Southern Rights migrate because of the latter. Lucky for us, whales follow a migration pattern, making sightings more predictable. 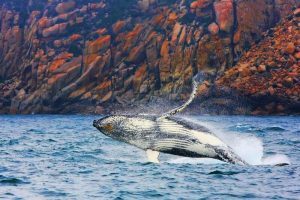 Plan a trip from May to July or September to November if you want to watch the immense Humpbacks make their way through the waters of Tassie’s east coast. Block off your calendar from June to October to spend time admiring rare Right Whales. You probably know this already, but whales are mammals just like us. Whales can see us and actually look at us as we watch them. Maybe that’s why they are such show-offs! Blowholes are the whales’ nostrils. Whales can communicate through vocalisations known as the “whale song”. Not all whales do the “whale song”. Male Humpback Whales do so but only during mating season and only in their mating areas. Humpback Whales can eat up to 1.5 tonnes of food a day! The Southern Right Whale is a social animal that likes interacting with other whales, dolphins, and even humans. Humpbacks, on the other hand, prefer to travel alone or in small pods of two or three. In the 19th century, Tassie’s whale population was so big that residents of a suburb of Hobart were constantly annoyed by the noise they made. Humpback Whales can eat up to 1.5 tonnes of food a day. Blowholes are the whales’ nostrils. 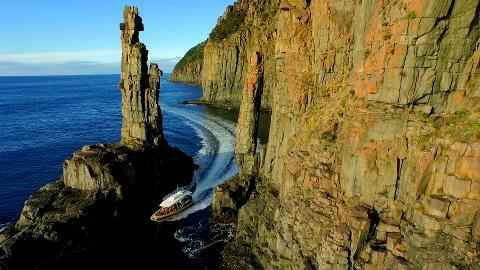 Where is the best place to go whale watching in Tas?